For any of you budding writers out there this is quite literally a fairy tale of success to keep your dreams alive. The Copper Promise started off as a serialisation and was self published on the mighty internet when along came an editor who saw it and the rest was history. So it just goes to show that dreams can and do come true. So back to the story itself. I was convinced to buy this book after hearing it described as a " character driven sword and sorcery novel with plenty of banter and magic." This is the first novel of The Copper Cat Trilogy and is followed by The Iron Ghost and The Silver Tide. It's really refreshing to see a female author stand out in such a male dominated genre of sword and sorcery and The Copper Promise has some great female protagonists such as Wydrin - The Copper Cat of Crosshaven. She's definitely one of the lads whilst also retaining her femininity. 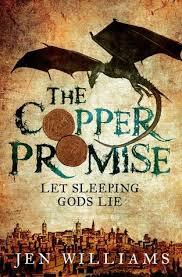 The Copper Promise starts off great with lots of action, intrigue and humour. For me it is the characters that really make the book and the relationships they have with one another. They all have great chemistry which is no easy feat to pull off in a book. Wydrin, Sebastian and Frith are all completely unique characters. They all harbour their own secrets, wrestle with their own demons and all keep secret their own desires. All of them as completely untrustworthy as the other. Together they form a highly dysfunctional band of broken haphazard misfits exploring the hidden underground depths of the arcane citadel each concealing their own personal agendas. Oh and they accidentally unleash a mighty god who feasts on death and destruction. This fantasy story has none of the old and overused fantasy cliches but instead is fresh and fun and you can tell as you read it that Jen Williams certainly had a lot of fun writing it. This is old school fantasy for the 21st century. What I really love about the writing is the clever humour that actually makes me laugh out loud throughout this book. "You look like a sack of dog's testicles, you know that? And I don't mean that in a nice way." As Sebastian and Wyrdin reluctantly help Lord Frith reclaim his family fortune they form a very fraught and dysfunctional alliance. However there is a lot of trouble ahead with the release of the mighty Y'Rouen who wants to destroy the world and seems unstoppable. As well as being really funny this book also has some dark terrifying moments with some truly horrific characters which add perfectly to the tension. This is a fantasy novel that ticks a lot of boxes for any fantasy lover. There are dragons, pirates, swell swords, castles, mages, sorcery, spells and magic. So if you want something that is really fun, full of crazy mishap adventures and banter of course, then look no further than The Copper Promise. This could be interesting. I'll check Professional Editing & Proofreading Service it later. I guess, this should be a nice option for me.